Note: This piece originally appears in Paste Quarterly #1, which you can purchase here, along with its accompanying vinyl Paste sampler. I have a confession to make. I’m not like you. I’m different. Why? Well, I have a college degree in communications. That’s right; I am a communications major. I’m essentially like a doctor or a lawyer but in communicating. I don’t like to brag about this for fear that my friends will be intimidated by my communicating prowess. (Note: They should be.) Instead, I just opt to let them think I’m one of them. One of you, a normie, or as we like to call them in Communication Major circles, a communications dum-dum. Below I have listed a handy guide to everyday situations we all have in normal life. Tear out this page (Note: only if you are the owner of this magazine or if you can guarantee you won’t be caught doing it). If you carry this list in your pocket and refer to it when necessary, I promise you’ll always have something to say, and it will be the right thing, too. As you lock your apartment door and see your next door neighbor, Irving, return from the grocery store. You enter the break room and see your co-workers standing around a coffee pot. One of them is crying. 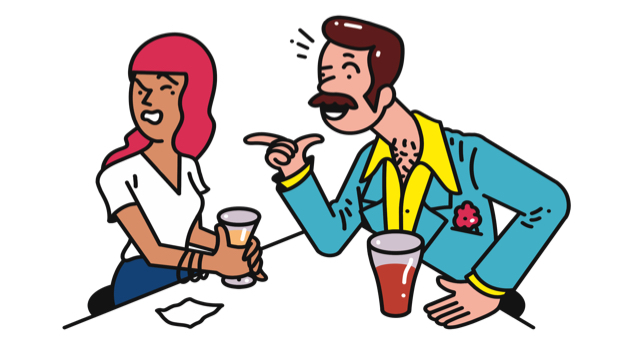 Bars are steadily becoming a new/hip “hotspot” to pick up a mate. (Note: not literally.) But you have to be aware that to stand out you need a conversation starter that not only cuts the ice but creates an arctic rift that will cause some conversational global warming. You see an elderly woman pass out in a 99 cent store. Your boss calls you into his office, three members of HR are present and a police officer. You are locked in a trunk with a person that you’ve never seen before. You are hog-tied and bloody and have a minor concussion. You wake up and find three oddly shaped creatures by your bed. You realize that you were right—aliens do exist, and they are about to either kill you, kidnap you or make you their human slave. But remember no matter how tense the situation there is no reason to not be polite. Try this as an opening line. You’ve probably seen Paul Scheer on TV before.